I love the uncluttered calendar and idle days of summer. There is time for traveling to new places and cultures, bingeing on books, and expanding interests and hobbies. While I cherish the possibilities of the open day, the open road, and the open book I still have the thoughts about library spaces and programming. There is time for reflection and forging forward with giddy anticipation for improvements and new implementations for the next school year. 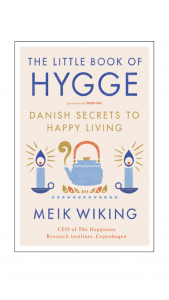 I recently stumbled upon a wisp of a book with a wealth of wisdom that immediately resonated with my philosophy of the library as the heart of the school-The Little Book of Hygge: Danish Secrets to Happy Living by Meik Wiking. This book succinctly summarizes a Danish way of life that explains how and why they have the highest rates of happiness in the world. With many of us traveling to new cultures and countries either physically or metaphorically through books I thought looking at our libraries through the lens of another culture a fitting summer exploration. Through research and experience the author Wiking attributes Danish happiness to the complete embrace of “hygge.” I am sure there are some ideas lost in translation, but the way Wiking frames the philosophy of hygge aligns with the many aims library programs have as an inviting, and welcoming place for students and faculty. There is something wonderful in the state of Denmark that we can apply to our library programs. The word “hygge” comes from the Norwegian word meaning “well-being.” Some speculate that the word is also related to the word “hug” from the earlier version “hugge”which is also from that region. It could also come from the Old Norse “hygga” which means “to comfort.” There is also the Old English word “hycgan” which means “to think and consider.” According to the author, hygge is more about atmosphere and experience than tangible things. Some refer to it as a “coziness of the soul.” Others describe it as “cozy togetherness.” All these meanings remind me of how many of us try to create a similar feeling and presence in our spaces. One of the unspoken but palpable aspects of libraries is that is is a refuge for people. This factor is often overlooked by outsiders or administrators that are only data-driven because it is hard to quantify. I am sharing about hygge to say it is not just the hushed tones that some seek when they enter a library; it is the community commons libraries offer. Embracing hygge can help us explicitly develop an environment and culture to serve to our students. Here are some key points of hygge and ways libraries can enhance their services incorporating it. Much of the discussion of hygge centers around cultivating a space that fosters comfort and contentment. This part of hygge reminds me of the ways good design in library spaces can generate more use from patrons. In some ways the list of recommendations to build hygge sounds similar to the best features libraries have always exhibited: small nooks for reading and contemplation, abundant warm light, comfortable seating and natural materials like wood. Traditionally in hygge, candles have been the favored light source for both the illumination and the warmth it creates. While this is not practical or safe for libraries incorporating natural lights whether through windows or lights and lamps heightens the feeling of hygge. I think about the regal reading rooms of the New York Public library as an example many libraries emulate. The book delves into foods and beverages with example recipes too. This made me think of the current trend libraries are moving towards with softened restrictions on food and drink in areas of the library, or adding cafes and food prep areas much like the bookstores in the last decade. This also fits with activities librarians plan that include food. I have noticed several AISL members share creative events they developed that had a hygge element through the comfort of food. It is also important to note that as many libraries move towards the learning commons model and open plan models that we do not lose the incorporation of smaller spaces, nooks, study carrels, and study rooms. The Danish relish smaller group settings and spaces for more contemplative activities. I notice in my own library that many students gravitate to the nooks and crannies of a library to get their work done; it offers a respite from the designs in classrooms where students are expected to perform and execute in a larger group setting. A positive side of the trend towards learning commons within libraries settings is that it acknowledges that we are social creatures. The other most important factor of hygge is happiness together. Spaces that allow common areas for collaborative work embody the social side of hygge. Fostering areas in the library where students can have a meeting of the minds or work on a puzzle together are more examples of hygge in action. Makerspaces, fab labs, and collaborative zones are another iteration of creating spaces that encourage social interactions of students for a common cause or problem. Equality is an important element in hygge. Wiking points out that Danes exhibit “relaxed thoughtfulness” where nobody takes center stage or dominants the conversation in a group. These communal spaces help students develop healthy social-academic interactions. Many librarians have shared their stories of successfully balancing these communal areas with the quieter zones to fully exemplify hygge in the the library. “The art of hygge is therefore also the art of expanding your comfort zone to include other people,” I found this quotation to be the most important as I try to embrace hygge in my outreach to colleagues and faculty. This reminds me to continually build relationships with teachers over time and that informal and smaller meetings are just a powerful as scheduled professional development. It also reminds me to invite others into the library to collaborate on creative projects. I found it intriguing that Danes say the best number for hygge is three to four people. I will keep this number in mind when embarking on new initiatives. Additionally, simplicity and presence of mind are cornerstones to happiness together. While many of the actions and advice I shared are not all new; looking at them through a new cultural lens can help improve and reinvigorate our current programs and spread happiness and joy in the process. Wiking, Meik. 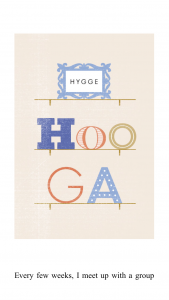 The Little Book of Hygge:Danish Secrets to Happiness. Penguin, 2017. This entry was posted in Uncategorized by Courtney Walker. Bookmark the permalink. Just tweeted your insightful post! Love your thoughts about library spaces as communal – fostering relaxed thoughtfulness, collaboration, and contentment! Well done and thanks for sharing.